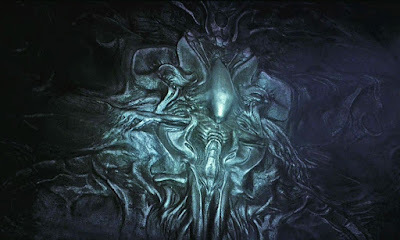 When Arthur Max took some of the motif's from Giger's derelict corridor design ribs and created columns that were almost plant like in nature and then gave the layout to the illustrators who developed that into drawings, Ridley looked at it and said, "Can we have a statue, a sculpture or something iconic in the middle that celebrates the Engineers?". He also wanted the place to have the feel of a cathedral with something quasi-religious about it. Steve Messing also talked about being involved in the design work, he perceived the chamber as a ceremonial room. Julian Caldrow worked on the details for this environment and created the set drawings. d) Who exactly were these engineers though? The idea was that the Engineers race are interplanetary visitors who from time to time over the millenias have come to Earth to give us upgrades - mentally and physically, there was also the idea that they engineered humanoid life forms throughout the galaxy. e) How would they celebrate themselves? They came up with the idea of a giant head and how it was part of the culture of the Engineers to build these things. So they appear to be associated loosely with the idea of Earths ancient head building culture. 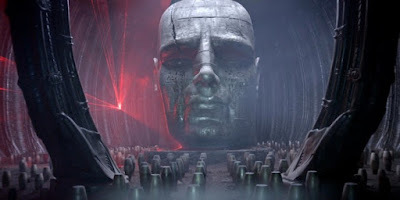 The centrepiece of a chamber that would come to be known at the Ampule Room, with the plant like columns that was set at Pinewood was a 32 foot tall monolithic head, which can be glimpsed in posters for the film. This was practically built by Arthur Max's team. Ben Mortimer: Was there a particular set piece from the film that you really hang your hat on?